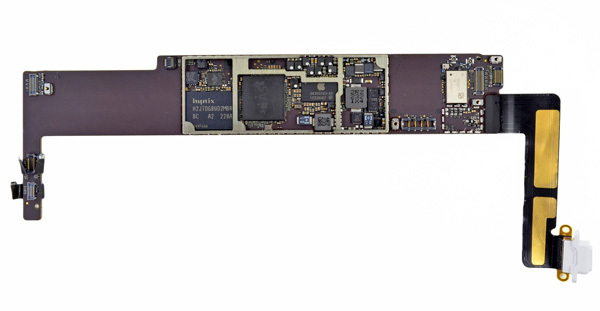 As I mentioned before, the bulk of the innovation in the iPad mini is around form factor - the hardware platform itself is mostly a reuse of previous designs to keep costs low. The mini retains the 32nm A5r2 SoC as the iPad 2,4 and 5th gen iPod Touch. Despite the smaller size, it also uses the same 1GHz CPU clocks as its bigger brother. 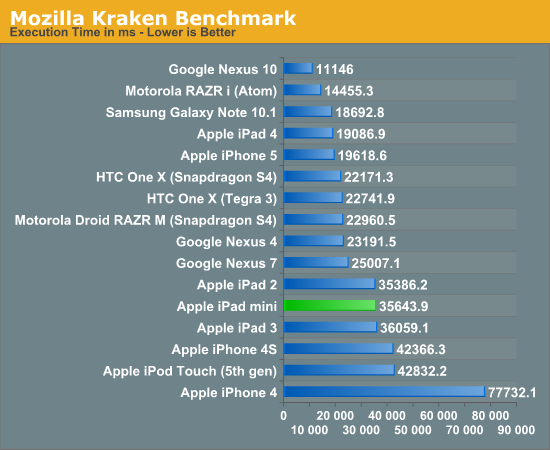 Performance is thus identical to the iPad 2,4, and a bit faster than the iPhone 4S. I found that the increase in clock speed does help to mask the fact that this isn't a Swift based platform, although going between the iPad mini and 4 does reveal an appreciable performance difference. 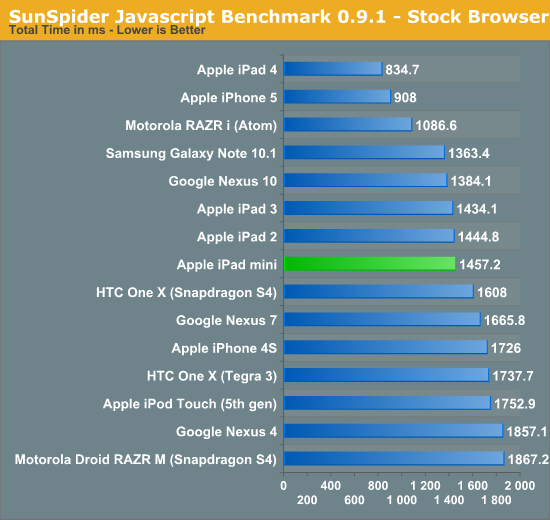 SunSpider has been a part of all of our mobile performance testing for quite a while now. It's not the perfect benchmark, but the test ends up being a good measure of browser performance as well as cache latency and CPU performance. The iPad mini's two Cortex A9 cores running at 1GHz give it performance that is pretty much identical to the iPad 2 and 3, which also feature the same CPU. In the grand scheme of things however, the mini's performance is decidedly last generation. That's not to say that it's bad, it's just that the Swift based architecture in the A6/A6X is significantly better. Here the mini shows its age a bit, but mostly because of its conservative CPU clock speeds. Google's Nexus 10 is finally able to flex its muscle here and show just what the Cortex A15 is made of, even outperforming Intel's Atom in the RAZR i. Also note the performance increase compared to the iPhone 4S/iPod Touch, that's purely due to the clock speed advantage (1GHz vs 800MHz). I don't believe Apple picked the wrong clocks for the A5 in the mini as battery life remains a primary concern for this device. Once again the mini equals the performance of the iPad 2 and 3, but remains appreciably slower than the iPad 4/iPhone 5. 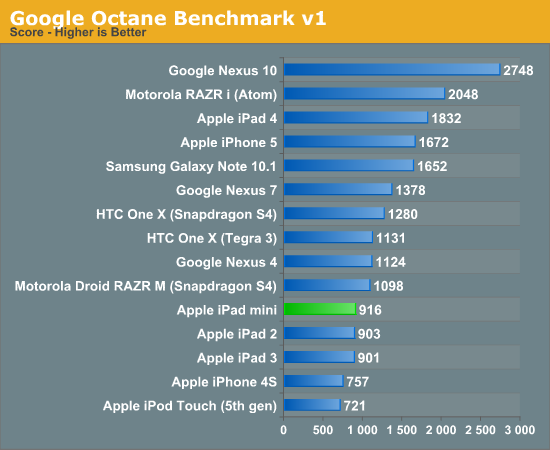 Google's Nexus 10 absolutely dominates in this test, continuing to outperform Intel's Atom based RAZR i.
I'd have to agree. While the mini is thinner and has perhaps somewhat better build quality compared to the nexus 7, when comparing them side to side, I'd have say my Nexus 7 was more comfortable to hold in one hand. Also it just happens to fit in my jacket pocket while the mini is too wide. I think the backside material of the Nexus 7 is what makes it so comfortable to hold, next to the size. Unlike my iPad 2 it simply doesn't feel uncomfortable at any point. Can't get to cold or hot or be slippery. The A format paperback is the kind you can shove in your back pocket. Easy to hold in one hand. The B is slightly bigger, and most people can hold it in one hand. The trade paperbacks are the bigger more expensive kind, more like a hardcover book but with a soft cover. Most people have to bend them to hold in one hand. The Nexus 7's width falls between A and B paperbacks in width. The iPad Mini is trade paperback size in width, even with the reduced bezel. Personally I think Apple goofed here, picking a size larger than what the publishing industry settled on as ideal for one-handed carrying and reading after decades of product testing. I'm pretty sure Apple chose to make the iPad Mini 7.9" instead of 7" because the 4:3 aspect ratio would've made movies on a 7" iPad smaller than on 7" 16:9 Android tablets. By making the iPad Mini 7.9" they make movies on it slightly bigger than on a 7" Android tablet. But the cost in one-handed holdability isn't worth it IMHO. Actually, the iPad mini is almost exactly the same size and shape as the Amazon Kindle 2 (the old white keyboard one), differing only in slightly higher weight. The dimensions are so close that I have to believe that Apple was using the K2 as a reference for the mini. Most K2 users agree that it is extremely easy and comfortable to hold one-handed for hours, and very easy to carry.